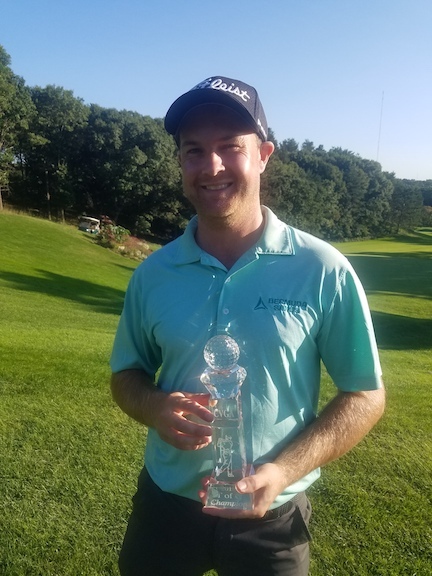 Thomas Campbell of Minnetonka won the 2018 CVGA Tournament of Champions for the second straight year shooting a blistering 66, winning the $750 first place purse at the Eau Claire Country Club. It’s back-to-back for Thomas who won in 2017. Finishing Runner-up was Keith Piotrowski who shot a sizzling 68. What great scores for these two great players. Yarri Bryn and Kelly Kretz tied for third, shooting -1 under par 70’s. Thanks to all who participated and to Mike Greer and the staff of the Eau Claire Country Club for setting up the golf course and having it in supreme condition. Our CVGA Player of the Year is Ryan Isaacson…Congrats Ryan, two in a row!! Our Amateur of the Year is Jacob Gaines! Congrats Jacob! Reminder: The CVGA Awards Banquet is Thursday September 13th at 6:00 (Happy Hour) and 7:00 Dinner. If you have not told me your coming…you need to. I need a solid head count by Tues.
T of C Skins Won: Kelly Kretz #3 and Jacob Gaines #15 $260 each! !